Mayonnaise and cholesterol management don’t seem to pair well together but in moderation the homemade mayonnaise recipe below can be part of your repertoire. The two key ingredients are moderation and olive oil. You eat mayonnaise less often. You choose (and know) what is in your mayonnaise so you can opt for an oil low in saturated fat and with high level of omega-9 fatty acid (monounsaturated fat) such as olive oil. 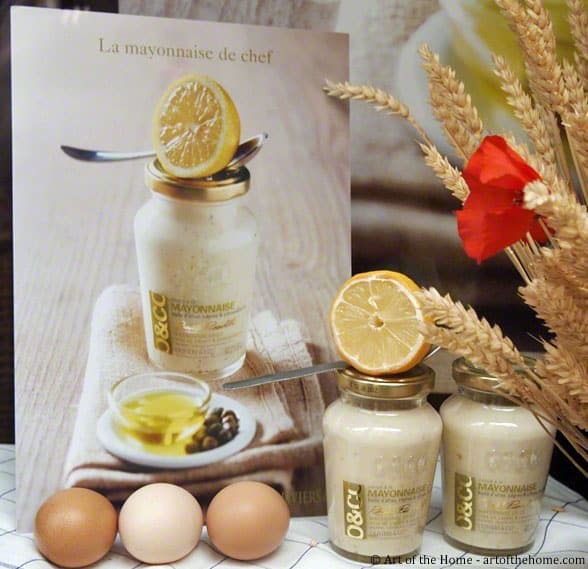 So check our detailed homemade mayonnaise recipe and Art of the Home suggestions below to get some mayo back in your diet without guilt — in moderation of course! Enjoy and bon appétit! Carefully separate the egg yolks from the whites (make sure there is no white otherwise your mayonnaise will not emulsify as easily if at all). Whisk egg yolks and salt&pepper together. Pour a few drops of olive oil in the egg yolk mixture and whisk vigorously. Keep pouring olive oil a few drops at a time until you see that the mayonnaise has thickened. At that point, pour the oil in a short thinstream stirring constantly. A wooden spoon can be used instead of a whisk. When you are done adding the olive oil, mix in about 1 tsp of lemon juice, taste and add salt and pepper as needed. Refrigerate (up to 24 hours). Even if you stored in the fridge, homemade mayonnaise should be enjoyed within 24 hours. Feel like some garlic? Check our aoili sauce recipe, a garlic homemade mayonnaise recipe from the South of France. Big crowd? if you need more mayonnaise, increase the number of egg yolks. Simply adding more oil will make your mayonnaise curdle. We recommend 1 egg yolk per 3/4 cup of oil maximum.